TALLAHASSEE, Fla. – The Florida Department of Environmental Protection announced a 38-acre addition to the Florida Keys Wildlife and Environmental Area on Middle Torch Key in Monroe County. The property is located within the Florida Keys Ecosystem Florida Forever project, ranked No.1 in the Florida Forever Climate Change Lands project category. This acquisition helps protect the outstanding waters and reefs of the Florida Keys, enhance recreational and commercial fisheries, and provide residents and visitors more areas of natural beauty to enjoy. The Monroe County Land Authority congratulated DEP, the Governor and Cabinet for this crucial acquisition. “We are very pleased to assist the State with these purchases and we look forward to continuing our partnership to protect the Florida Keys,” said Land Authority Chairman Danny Kolhage. The property has long been considered a high-priority acquisition by the Florida Fish and Wildlife Conservation Commission (FWC) because of its pristine condition and location on sparsely settled land. “We are excited these key properties are being added to the Florida Keys Wildlife and Environmental Area – conserving some of the last remaining critical habitat in the Lower Keys and providing a vital source of food and freshwater for numerous rare species and migratory birds,” said FWC Land Manager Randy Grau. The parcel contains ponds and wetlands important to a variety of wildlife species dependent on a year-round source of fresh water, including Lower Keys marsh rabbit, striped mud turtle, ribbon snake, Key deer and numerous other indigenous species. Many local birds such as the white-crowned pigeon depend on larger intact hammocks for food and nesting areas. In addition, native fruiting trees and shrubs in these hammocks provide food and shelter for great numbers of migratory birds. 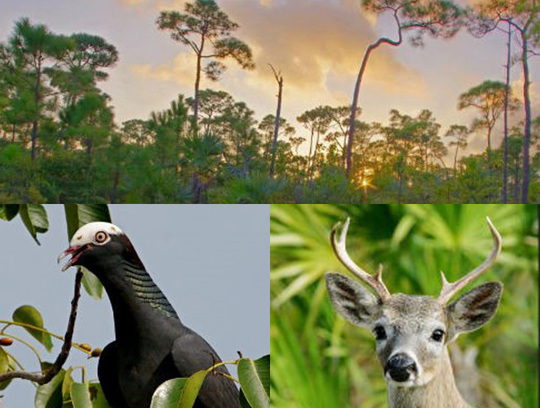 Florida Forever is the state's conservation and recreation lands acquisition program, a blueprint for conserving our natural resources and renewing our commitment to conserve our natural and cultural heritage. The Florida Department of Environmental Protection's Division of State Lands is Florida’s lead agency for environmental management and stewardship. The Florida Department of Environmental Protection is the state’s principal environmental agency, created to protect, conserve and manage Florida’s environment and natural resources. The department enforces federal and state environmental laws, protects Florida’s air and water quality, cleans up pollution, regulates solid waste management, promotes pollution prevention and acquires environmentally sensitive lands for preservation. The agency also maintains a statewide system of parks, trails and aquatic preserves. Visit the department’s website at FloridaDEP.gov.